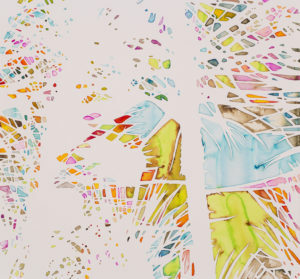 James Harris Gallery | Claire Cowie: "Pathways"
James Harris Gallery is pleased to present our seventh exhibition by Claire Cowie. 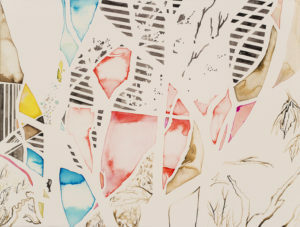 The show titled Pathways focuses on works on paper, the core of the artist’s practice. Cowie’s work usually centers on the world around her as she develops ideas and personal iconography based on family, friends and experiences. Her works on paper have always been rooted in the landscape of the mind as well as the physical landscape surrounding her. 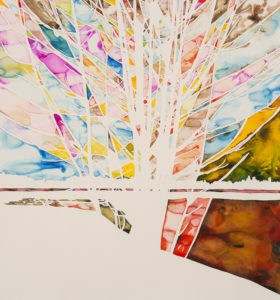 In her last show at the gallery titled Dead Reckoning, Cowie presented a large scale multi-panel drawing which emphasized her interest in mapping out a journey. 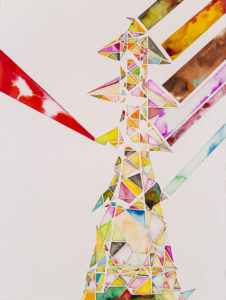 Through her trademark use of watercolor and collage the work reflected the human, fallible process of charting one’s progress and rectifying mistakes along the way. 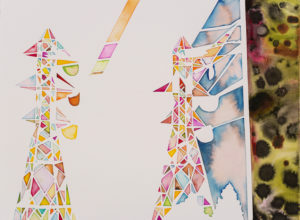 In her current work, the artist takes these ideas to explore the journey from home to work on her bicycle. Cowie has often employed the camera as a starting point for her work. 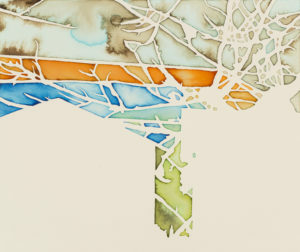 Now she has taken photographs of the Seattle urbanscape during her bike commute and used the resulting photographic images as a compositional basis for a new series of watercolor and ink drawings which depict the fractured landscape along her moving path. Like much of Cowie’s past work, the new drawings – though guided by actual events or places – track a shifting sense of landscape. 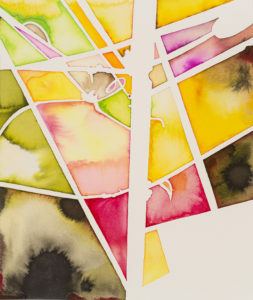 Cowie’s typical attention to the importance of negative space is now used to break up areas of intense color. 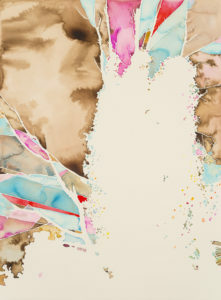 The pieces are decidedly more dense, complex and saturated than earlier work, reading as completely abstract in some areas and depicting moments of referential imagery in others. The overall compositions reveal not only the architecture of the built environment but offer a dream-like mindscape. 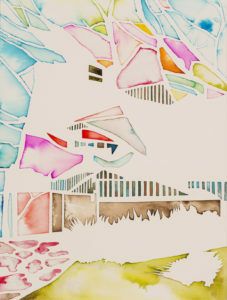 Cowie’s work highlights the fragmentation of memory and time as she captures fleeting moments in a shifting environment. In this series, she has purposely moved away from incorporating characters, animals and figures, but her interest in community remains. 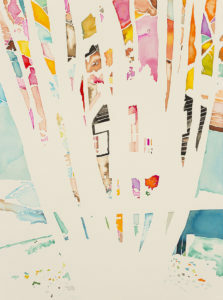 Claire Cowie uses a variety of media to reference the natural world around her home in Seattle, as well as around the world. 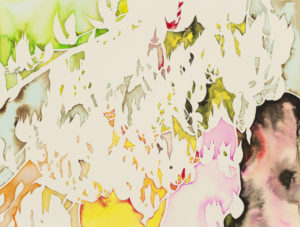 Cowie utilizes symbols of the natural world such as birds, insects, and a variety of plant-life, as well as heavily using the negative space in a work. 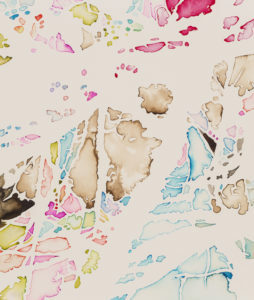 By using watercolor and ink in the areas around her subject Cowie references the fragmentation between the natural world and us, as well as of memory. 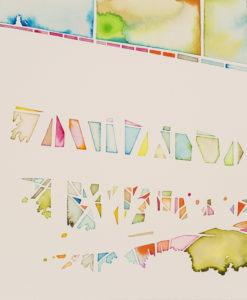 The colors and shapes in her work create dream-like landscapes that pull in characteristics of urban architecture. Claire Cowie lives and works in Seattle, Washington, where she is a lecturer at the University of Washington. Cowie attended both the North Carolina School of the Arts (Winston-Salem, NC) and Washington University in St. Louis (St. Louis, MO). She received her MFA from the University of Washington (Seattle, WA). 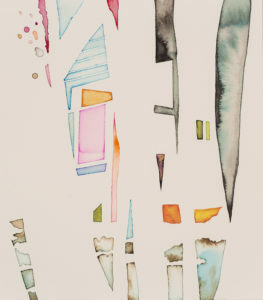 Cowie’s work has been exhibited both nationally and internationally, including shows at the Henry Art Gallery (Seattle, WA), Takeda Biennial (Oaxaca, Mexico), Tacoma Art Museum (Tacoma, WA), Frye Art Museum (Seattle, WA), Shenzhen Art Institute (Shenzhen, China) and the Art Gym at Marylhurst University (Lake Oswego, OR). 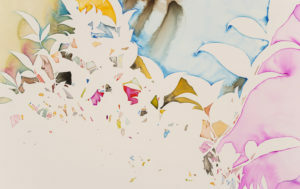 Her work is included in the collections of the Henry Art Gallery (Seattle, WA), Microsoft Corporation (Redmond, WA), Safeco (Seattle, WA), and Tacoma Art Museum (Tacoma, WA), among others. 8 3/4" x 10 1/2"
16 1/2" x 12 1/2"
55 1/4" x 51 1/4"
11 1/4" x 9 1/2"
25 1/4" x 26 3/4"